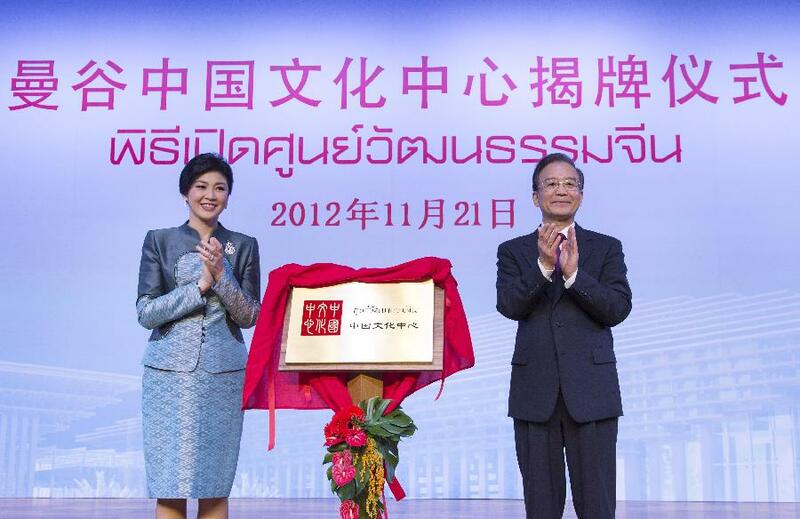 Chinese Premier Wen Jiabao and Thai Prime Minister Yingluck Shinawatra attended the unveiling ceremony of the Chinese Culture Center in Bangkok, Thailand on Nov 21. The Chinese Culture Center in Bangkok is located on Wenhua Road, Hui Huang District, Bangkok. On its right side lies the Thai National Culture Center, and the Thai Culture and Arts Exchange Center is located opposite. The overall construction of the center features a blend of Thai and Chinese classical architectural language, using both Chinese column beams and Thai temple styles. It is equipped with an exhibition hall, a small theater, a library, and several training rooms for Chinese music, dance, and painting and calligraphy workshops, providing multifaceted services such as information and teachers so that Thai people can understand and learn more about Chinese culture.